What is Sum Of The Parts (SOTP) Valuation? Sum Of The Parts (SOTP) valuation is an approach to valuing a firm by separately assessing the value of each business segment or subsidiary and adding them up to get the total value of the firmEnterprise ValueEnterprise Value, or Firm Value, is the entire value of a firm equal to its equity value, plus net debt, plus any minority interest, used in valuation. It looks at the entire market value rather than just the equity value, so all ownership interests and asset claims from both debt and equity are included.. It can be used in conjunction with various valuation techniques such as Discounted Cash Flow (DCF) modelingDiscounted Cash Flow DCF FormulaThe discounted cash flow DCF formula is the sum of the cash flow in each period divided by one plus the discount rate raised to the power of the period #. This article breaks down the DCF formula into simple terms with examples and a video of the calculation. The formula is used to determine the value of a business and comparable company analysisComparable Company AnalysisHow to perform Comparable Company Analysis. This guide shows you step-by-step how to build comparable company analysis ("Comps"), includes a free template and many examples. Comps is a relative valuation methodology that looks at ratios of similar public companies and uses them to derive the value of another business. Below is a screenshot of a Sum Of The Parts (SOTP) valuation from CFI’s Advanced Financial Modeling Course on Amazon. As you can see in the image below, Amazon is divided into several different business segments, which are each separately valued using comparable company analysis and then added together at the end. The first step is to determine what the appropriate business segments should be to value the firm. Many companies report segmented information, which makes things easier. If they don’t, it may take some deeper digging to get a breakdown of performance across different parts of the company. Once you know the various segments, you must then pick a valuation methodValuation MethodsWhen valuing a company as a going concern there are three main valuation methods used: DCF analysis, comparable companies, and precedent transactions. These methods of valuation are used in investment banking, equity research, private equity, corporate development, mergers & acquisitions, leveraged buyouts and finance for each one. You would most likely pick either a DCF (intrinsic valueIntrinsic ValueThe intrinsic value of a business (or any investment security) is the present value of all expected future cash flows, discounted at the appropriate discount rate. Unlike relative forms of valuation that look at comparable companies, intrinsic valuation looks only at the inherent value of a business on its own.) or Comps model (relative valueRelative Valuation ModelsRelative valuation models are used to value companies by comparing them to other businesses based on certain metrics such as EV/Revenue, EV/EBITDA, and P/E) to value each one. 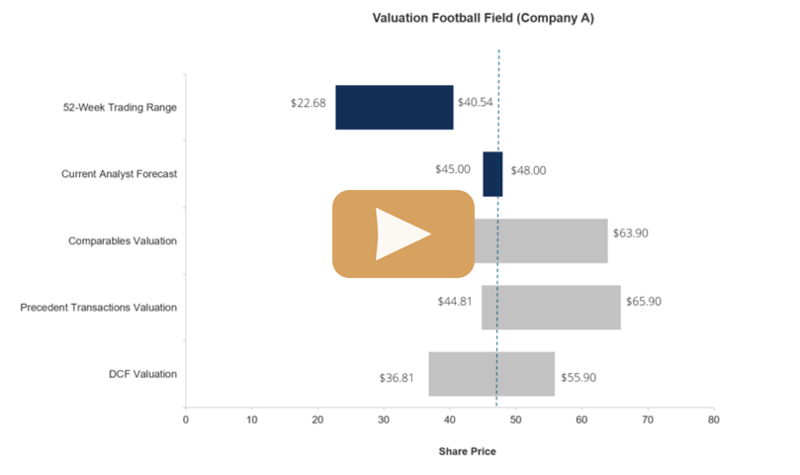 In the example from CFI’s Amazon Valuation Course, we use Comps to value each segment and apply an EV/Revenue multipleEnterprise Value (EV) to Revenue MultipleThe Enterprise Value (EV) to Revenue multiple is a valuation metric used to value a business by dividing its enterprise value (equity plus debt minus cash) by its annual revenue. 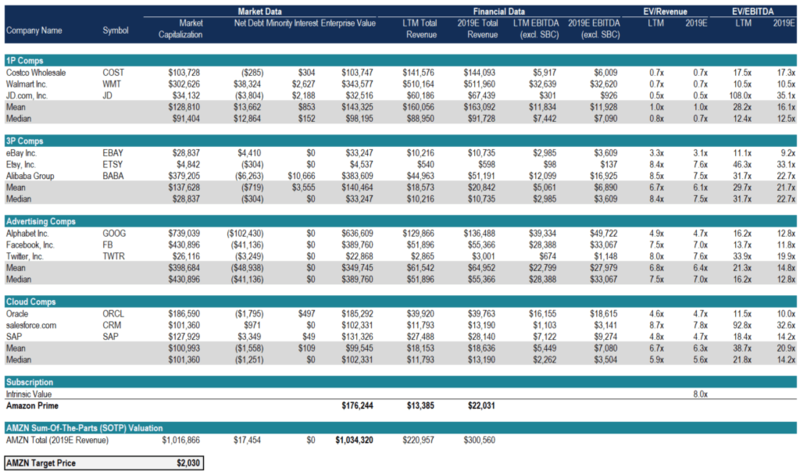 The EV to Revenue multiple is commonly used for or EV/EBITDA multipleEV/EBITDAEV/EBITDA is used in valuation to compare the value of similar businesses by evaluating their Enterprise Value (EV) to EBITDA multiple relative to an average. In this guide, we will break down the EV/EBTIDA multiple into its various components, and walk you through how to calculate it step by step to each segment. The final step is to add up all the segments and make any necessary adjustments. In the case of Amazon, we add up each business unit to get the total enterprise valueEnterprise ValueEnterprise Value, or Firm Value, is the entire value of a firm equal to its equity value, plus net debt, plus any minority interest, used in valuation. It looks at the entire market value rather than just the equity value, so all ownership interests and asset claims from both debt and equity are included. of the company. Then, we add cash and subtract net debt to get the total equity valueEquity ValueEquity value, commonly referred to as the market value of equity or market capitalization, can be defined as the total value of the company that is attributable to shareholders. To calculate equity value follow the examples and step-by-step instruction in this straightforward guide from CFI., and finally, divide the figure by the weighted average shares outstandingWeighted Average Shares OutstandingWeighted average shares outstanding refers to the number of shares of a company calculated after adjusting for changes in the share capital over a reporting period. The number of weighted average shares outstanding is used in calculating metrics such as Earnings per Share (EPS) on a company's financial statements to arrive at the target price per share. SOTP valuation is very useful for some companies, but not for others. Below is a list of examples of when this type of analysis is useful, and when it isn’t.